Do you put up a tree for Halloween? Putting up a Christmas tree is an established tradition. But a Halloween tree? Should we make that a tradition too? it seems like ever since that movie "The Nightmare Before Christmas", people have started trying to combine or to take Christmas traditions and incorporate them into Halloween. Do you know that they sell Halloween trees? Do you put up a Halloween tree? What kind of decorations do you use for Halloween? What is the tradition behind Christmas trees? Does Halloween and Christmas serve the same purpose? Coping or integrating customs into one celebration to the other is not a good thing. Let every custom have its own traditions to differentiate it from the other. I love the pumpkin decorations in Halloween and candles and Christmas trees in Christmas. I don't think this its a good idea. A Christmas tree is only for Christmas. Its not good to behold. You are right. I believe that a tree is only for Christmas. I don't like the idea of Halloween tree since it will just scare the children in your home. And I will never find it attractive. It is okay to have this for an event like a Halloween party or trick or treat but having this in our home is not a good idea. Yes that is right, I believe that having a Halloween tree might be awkward to see since it was not been on our tradition before to have such thing during Halloween. Maybe I would just put up a squash image so that it might look interesting and would really fit on the occasion for the Halloween.. I agree with this. Both events have different traditions. Christmas is for the birth of our Lord Savior Jesus Christ, while Halloween is for the dead. They are two contradicting events that do not serve similar purposes. And what the hell, a tree? I agree with you. Christmas is for the birth of our Lord and Savior Jesus Christ. Halloween is for the dead. Tree is already associated with Christmas. They must think of other objects and not the tree. I know right? The Halloween organizers or planners, or whatever they call themselves should come up with a better idea to signify the Halloween. Not a tree, come on now. That is right. I have never seen a tree for halloween. I dont know how it must be looks like if they use it in halloween party. Christmas is better to celebrate than Halloween. In Christmas we celebrate the birth of our Lord Jesus Christ. We are forever grateful for what he has done for us. If not for the coming of Christ, we won't be saved. Christmas is the pinnacle celebration of the year, well, I'm not sure maybe next to New Year's. The only downside of it is it's costly and expensive especially if you have a lot of godsons and goddaughters. Some people act like Scrooge when the event comes, or they go to malls to avoid potential children asking for "aguinaldo" on the 25th. Haha! Halloween is not a type of Christmas. It happens to have fancy dressing and scary escapades. It is nothing to compare with Christmas. Or is it a counter of the devil for Christmas? You have a good point. Let us make one holiday as unique as the other. There's no need to make them similar in some ways as they are celebrated for different reasons. I don’t really think I’d be into having a “Halloween Tree.” Christmas trees are something special, both to me and millions of people across the globe. I can’t wait for that one time a year to put a beautiful tree in my home and decorate it with all those festive lights and ornaments. Doing something similar for another holiday would be taking away the novelty of that experience. I’m going to stick to putting out pumpkins and spooky skeletons and bats. That’s the way I feel about it as well, the novelty behind putting up decorations like lights and Christmas trees. It feels special because it’s something you only do that one time of year. It’s like a Thanksgiving meal; it wouldn’t taste so good if it weren’t for the fact that you only combined those specific foods that one time a year. I totally have to agree on the Christmas lights part though, as I keep my lights hanging in my room throughout the whole year simply because I love the ambiance, haha. Well for me I think it's not good to combine Halloween and Christmas as they are different. Christmas is for joyful because it was Jesus' Birthday while Halloween is for the souls and Christmas is so special. They should be differ. We can have that Halloween tree but of course not the same as Christmas Tree. We can still use tree particularly "spooky dead tree" but there's no decoration on it. We can use cob webs and a bat or a white lady floating beside the tree. It will be just use when there's a Halloween Party but not necessarily decorate it during the whole month of November. They are not the same with christmas tree as christmas tree has colorful decorations. I am not referring to the picture posted above. Honestly It is funny to think that someone sell treesbfor the halloween season because the tree is often associated in christmass and we get used into that way of thinking. I am willing to try these kind of decoration since it is innovative and quite unique that may make our day of the halloween to be a much more special one. I usually put some artificial spider webs in our house and some pumpkins. I agree with you. Honestly, I have never seen a Halloween tree in any house. Christmas tree is the common tree that I know. But I like your idea of putting an artificial spider web in your house with pumpkins. That is the usual decoration that I see in every event or home. I know some people who decorate their house for Halloween. They even put a doll witch on a broom which is scary. No, we don't really set up anything elaborate for Halloween. We usually just use black lights in place of the regular led lights. Last year, my son displayed a glow in the dark skeleton and some cob webs but our cats unfortunately attacked the decors. I don't think I'd like to put up a Halloween tree soon because it's too much of an effort for a one-day occasion. At least during Christmas, we get to enjoy the Christmas tree for at least a month. Well, here in my country we don't actually focus on Halloween, just a simple trick or treat. What we make important the most is Christmas because it's Christ's birthday, and needed to celebrate the most. Really? I never heard that they sell now trees for halloween. I guess to some who are really trying to celebrate this kind are more with company events, yeah this is gonna be part of their decoration. For people I guess that admire most Harry Potter, this is a must for them. So I guess its okay to use only for events but its kinda exaggerated if they will put trees inside their house. Different countries have different culture so I find every answer here very amusing. I have learned new things here as I go through the comments. In our country, I am bot sure if we "celebrate" or "observe" halloween. In Western countries, they have this Trick or Treat event during halloween but here in my country we seldom observe that especially in rural areas. Also in some countries they put up halloween decorations like skulls, witch, etc. It is my first time if ever to know if there are people who will put up a tree as halloween decorations. But in our home, there is no such thing. That's a good idea, using the Christmas tree twice a year, on Halloween and on the Christmas Holidays. I could decorate my tree so that it would look scary. I totally like the idea of decorating it with holoween stuff like bats and jack-o-lanterns and all the scary stuff. I am a Hindu and I do not know much about Western Culture. can anyone tell me whether Halloween is a Christian tradition or a Pagan tradition? By the way we people in Nepal has a tradition that is quite similar to Halloween. WE call it "Gathe Mangal" which happens to fall in June or July. Good to know I never knew that Halloween trees were put up, thanks for the business idea. However why do I not that the will sell? Isn't this like a waste of money, depending on how expensive these trees actually are? If you have kids I guess that this is a good idea to make the holiday season more interesting for your kids. I think because of all the fun activities that surround Halloween, kids enjoy it most. Halloween is not that popular in Nigeria and this is the reason we don't always spend money on getting those trees. I have read where you can order for it from abroad, but it seems that this is not feasible to everyone that we have in the country. So, everything is all about how you want to make things work for you. I saw a Halloween tree a couple of years ago - I think it’s fairly new, at least where I live. We only put up a tree for Christmas, and I don’t know that I’ll ever get a Halloween tree. Each to their own, though - if someone wants to celebrate that way I say go for it! I haven't seen a Halloween tree yet. I don't think I will be putting a Halloween tree also. In our country, most family are already putting up Christmas trees as early as the last week of October or even September. There is already a countdown when it is 100 days to go before Christmas so I don't think there will be a need for a Halloween tree. I have never tried that kind of decorations in halloween. I never saw either. What I know is others dress up a halloween custome for party events. Putting christmas tree for halloween is something different and unique. Honestly, I never set up any decorations for Halloween. I feel so scared if I will have it in our home. What we prepare for Halloween are candies since a lot of kids in our neighbor go to houses and asking for candies. But I believe that some people spend money to have their home decorated for Halloween. I think it is cool for them but not for me. I have never done that particular thing wherein I will put a Halloween tree in our house since it is not one of our tradition. During Halloween we just make some treat or trick and have some candies for it. we also go the burial site of our love ones to pay respect for them and give them some prayers since we think that they really need it to let their soul clean and for them to be happy. Putting a tree would be more scary, especially when the tree has no leaves as we see on the movies most of the horror film in the cartoon has trees with no leaves, so I guess it will become better if you will put some bats on it. We don't have something like that tradition. There are however some people making use of the halloween parties and they put on some of the traditions on the day of the dead. But that is all that I know. Never tried something like that or have taken part into something like this. I never experienced putting up a tree for halloween. My family used to set up a tree for Christmas but not for halloween. It is also rare to see halloween trees in my country. I don't think its a good idea since I hate scary and creepy object. But I don't know, I may try it sometimes and see if it'll look good for a Halloween themed party. My country isn't all that big in the Halloween tradition. Few shops decorate their businesses with Halloween theme but that's it. Though there are events like Trick - or - Treating in my area, but parents are reluctant to let their children go door to door for candy. Some offices do a costume party but that's about it. Well, we don't really celebrate Halloween that much, but I guess putting trees with some web and bats on it would be nice, because it represents the dark night. In our country, we don't really celebrate Halloween, so it's not such a big deal for us to decorate our house with something creepy or for trick-or-treats. Putting and decorating a Halloween tree seems odd especially in our place. Judging at how old-fashioned my neighbors are, they might think something's wrong with our household or some, probably, would find it amusing. Not with that kind of tree. I have seen a lot of decorations for halloween including tree with cob webs but basically it's a dead tree or a tree with no leaves. 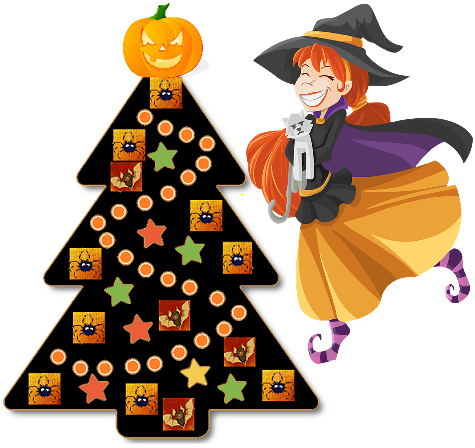 Both events are contradicting so it's not good to design a halloween tree that is exactly in a Christmas Tree. I have not seen any christmas tree in a Halloween event and I think it's a little bit weird. We can only see that maybe in movies. Of course yes, and one of my favorite happens to be pumpkin head tree with fire flames inside. They seem to look very scary and it's the reason why I love using them every Halloween season. I also love scarecrow as well especially when I have lots of land mass to fix them up. During Halloween we don't have much decoration since we mainly goes to the cemetery to visit our love ones who already died to give them time and to pray for their souls. it is also a bonding moment for our family and relatives since we are being united during that particular event which makes it more enjoying and interesting. I just cleaned our 8 year old Christmas Tree earlier and I'm planning to set it up as a Holloween tree by next weekend. Earlier I was thinking of what to put on top. I'm choosing between a witch on a broomstick and a Jack-o-lantern. This is the first time I've heard of such a thing. I don't think I'll ever have one. I've seen real trees outside that are decorated with Halloween ornaments. But I have yet to see someone actually set up a tree for Halloween. Especially, the way Christmas trees work. It's much better to focus on the more recognizable aspects of Halloween. Ones such as the Jack-O-Lantern and other carved pumpkins. They feel more authentic to the spirit of All Hollow's Eve. Honestly, my family does not really celebrates Halloween. We don't actually build or set up any horror props like skeleton or that tree you are talking about. We don't also wear Halloween costumes during trick or treat. The only thing that we do is to give candies or any sweet treats to kids who are knocking on our doors. It maybe sounds boring and lonely for me and for my family but we're contented to have a solemn All Saints and All Soul's days. But it became a tradition to take part on that event so it's fine. The important is we wouldn't miss to come to our family's grave. I was actually baffled when I read the heading: Halloween tree. I thought it was some tradition in other countries that I never knew about. Well, It figures since I've never watched Nightmare before Christmas. Hmm, as far as Halloween traditions, I don't think that putting up a tree would fit that much. People from where I came from have various of traditions that are almost done outside. So putting up a tree would just indicate that we are too eager for Christmas that we feel like skipping Halloween. Honestly speaking, I have never celebrated Halloween. I have only found myself putting a Christmas tree. There are so many celebrations that place around the world, but I only celebrate a few such as Christmas and Happ New Year. Each country has its own celebration, and I also celebrate some. It is good to understand your traditions, because of these celebrations are not for all. I'm a pretty big fan of Halloween and the lead up to it. But I've never in my life bothered with putting up a Halloween tree. Decor? Sure, but a tree? Nope. Never will either. Christmas is the time to showcase your art around your Christmas Tree. How different was yours? Trees around the house, to cut or not to cut that is the question.